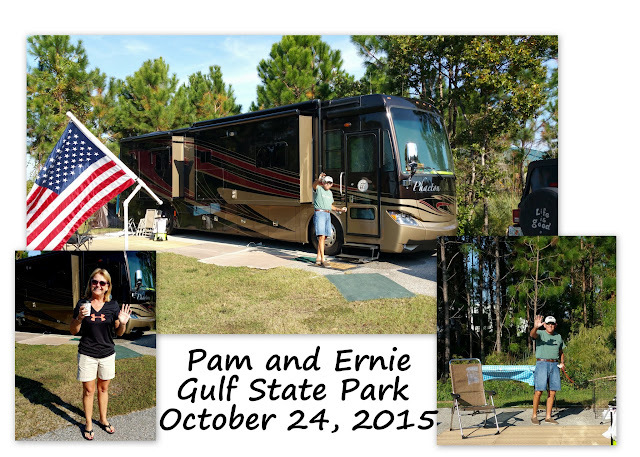 On Saturday, October 24, Pam and Ernie quietly checked into the campground and surprised us. 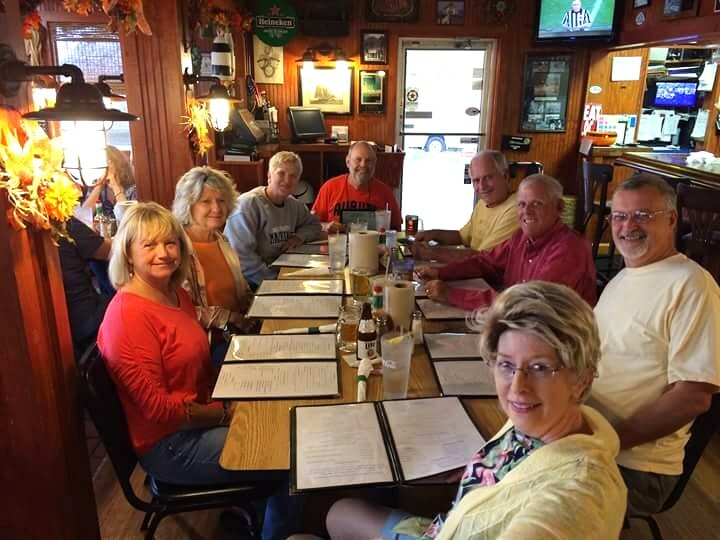 Wayne looked up from his dinner and remarked, "there goes a coach just like Pam and Ernie's" -- then he saw the red Jeep and exclaimed "that is Pam and Ernie!" as we ran out to greet them. 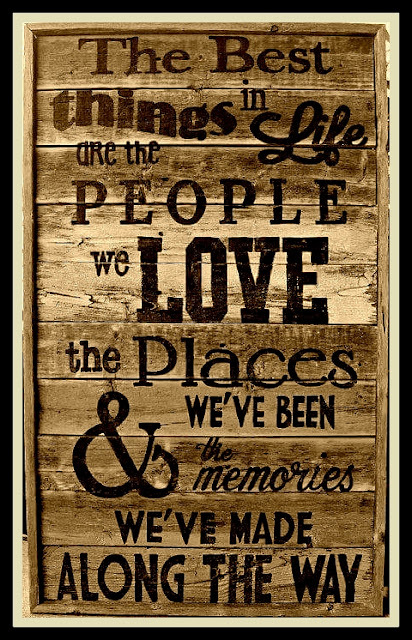 It was last April when we said our goodbyes right here in this campground. That's when my brother died and Pam and Ernie left for Red Bay, Alabama and then on to Maryland. Five days later, on Thursday, October 29, Linda and Dale pulled in. Although they had reservations well in advance, there was no campsite available for them when they arrived. After much frustration and negotiation, followed by a reduction in their rate, they were assigned campsite #161 at the end of the street. We all were angry over the reservation mix up since Linda was not feeling well. 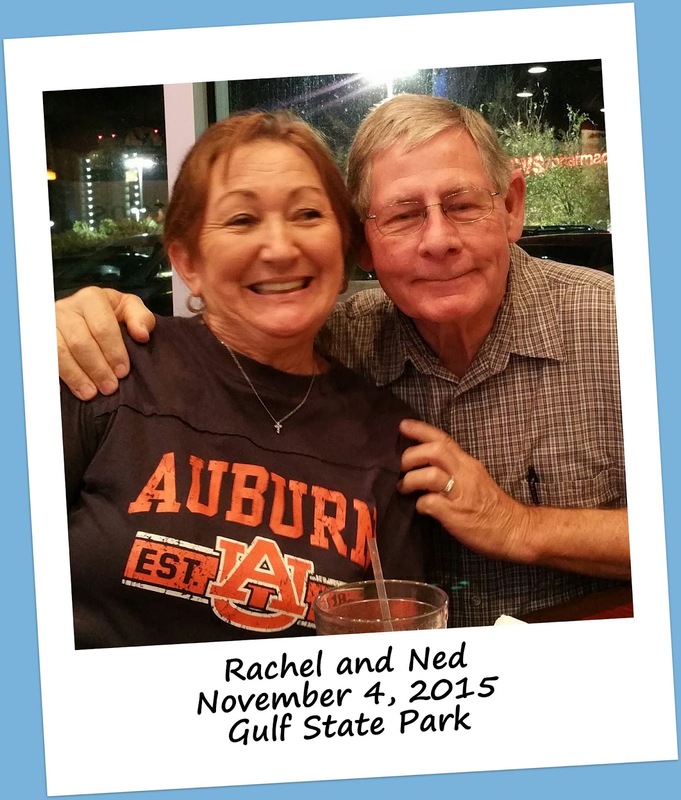 They will be here two weeks before moving on to Seminole Campground in North Fort Myers for winter. 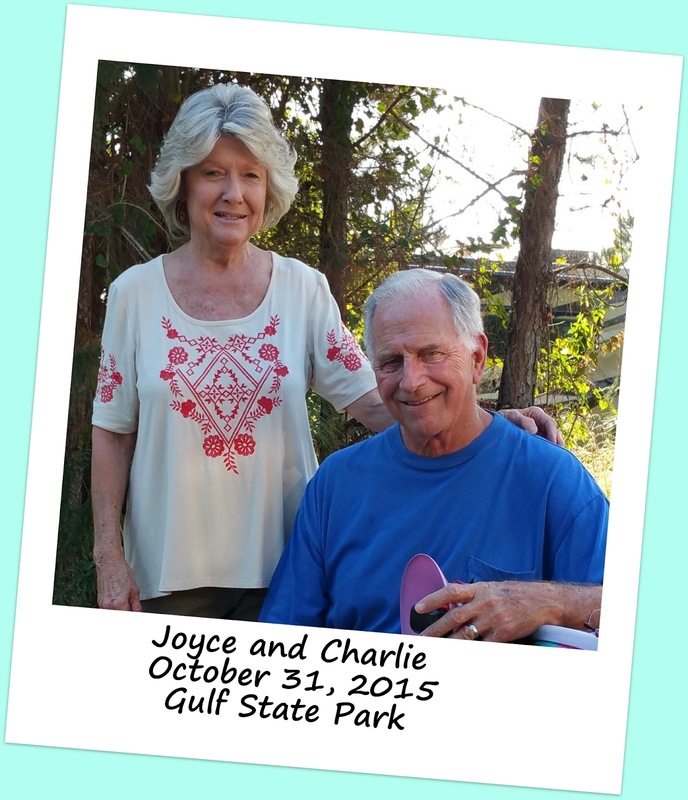 Two days after Linda and Dale arrived, Joyce and Charlie pulled into #175. That was Saturday, October 31. 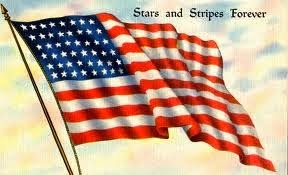 They will be with us all through November and into December when we travel on to Louisiana and then Texas. It was no surprise that we would go out to eat in celebration of being together even though there were still more of us to come. First group dinner. 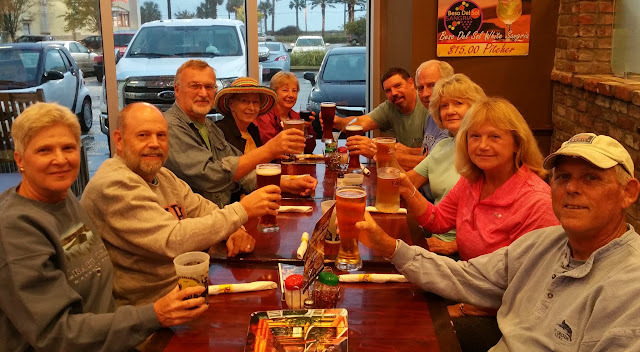 We were at King Neptune Seafood in Gulf Shores. Starting at the bottom, going clockwise, ladies first: Linda, Pam, Joyce, me. Then Wayne, Charlie, Ernie and Dale. Next came Fran and Mary on November 1st. 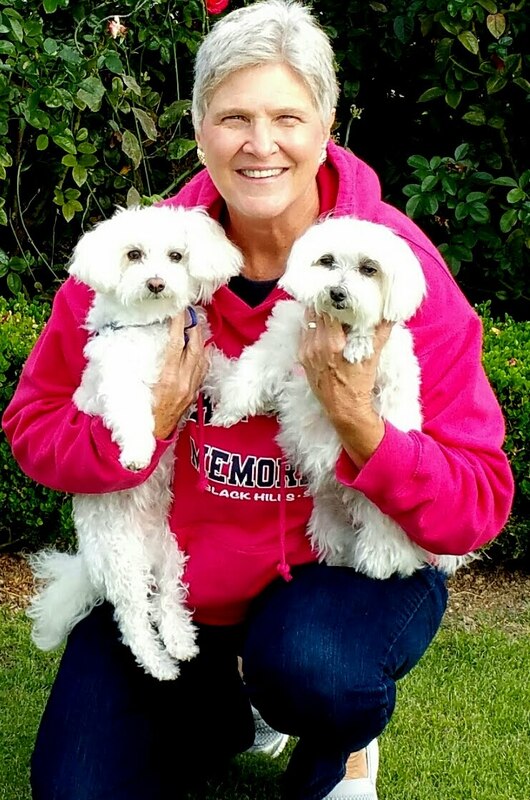 They would be with us less than a week. 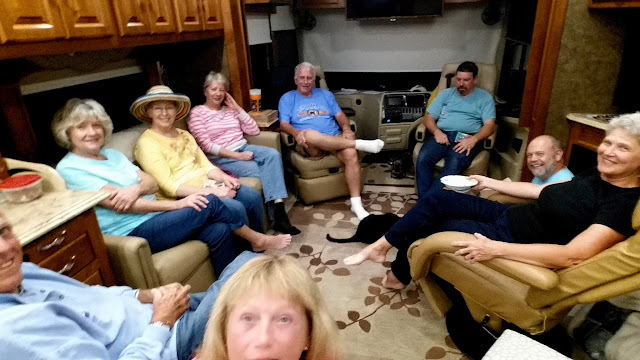 Like Linda and Dale, Fran and Mary are headed to South Florida where they will spend time with family on the east coast and then move over to Seminole Campground in North Fort Myers. Pizza night at Rotolo's on Orange Beach. Here, we all are in Pam and Ernie's coach. Pam is learning to use the selfie stick. That's her in front with Ernie to the left. Joyce, Linda and Mary on the couch. Charlie and Fran in captain's chairs, Wayne on the floor and me in the chair. Finally, on Wednesday, November 4, Rachel and Ned joined the group for their short week long stay. We hope to learn some more about Alaska from their trip there last summer. And with that, we were all together; even if it was for just a little while.